Great that you’ve already participated six times at the Ajax Camps. What’s your connection with the Netherlands and how did you come in touch with the Ajax Camps? I was born in the Netherlands and when I was 3 years old we moved to the Bahama’s. We still visited the Netherlands almost every year since, because of our friends and family over there. When I was 6 years old, I tried the Ajax Camps for the first time. I liked it so much, that I wanted to do it again the next year. After that, I participated at the Ajax Camps every year since. What do you remember from your time at the Ajax Camps? I participated at the Ajax Camps as a player and as a goalkeeper. In my first year, I became MVP (Most Valuable Player) as a player. I also won the goalkeeper award during my third Ajax Camp and won the 1 on 1 competition last summer as a player. I’ve learned a lot of skills during my time at the Ajax Camps and I still use these skills over here in the Bahama’s. So, you’ve participated as a goalkeeper and as a player? Yes, because I like to do both. As a goalkeeper, I like to dive and jump in the goal and you have to be very quick. As a player, I like to use the skills that I’ve learned during the Ajax Camps. In the future, I hope to figure out if I want to continue as a player or as a goalkeeper. What did you like the most about the Ajax Camps? I liked the high skill level at the Ajax Camps. The coaches were very friendly. If there was something wrong, they always tried to fix it and they were always supportive. The lunch was also very good. I liked the ham- and salami sandwiches. I also made a lot of friends during my time at the Ajax Camps. I met Sam at my second Ajax Camp and we still see each other every year since. Last February he and his family visited us in the Bahama’s. Your brother Andreas also participated at the Ajax Camps, right? Yes, he participated at the Ajax Camps twice. He is younger than me, so we were not in the same group during the camps. 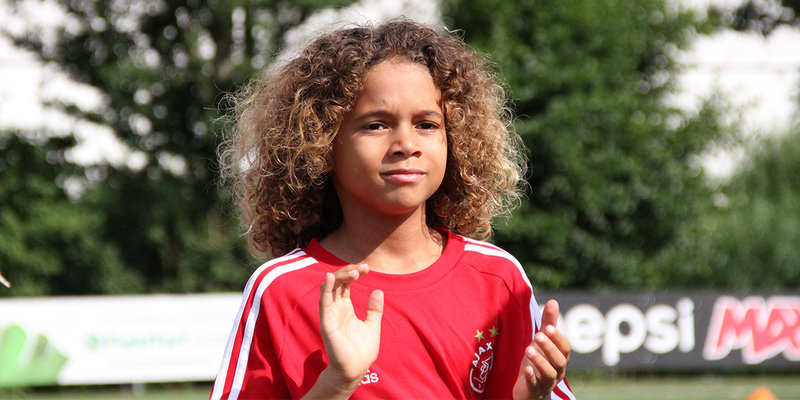 Andreas participated as a player and he also liked the Ajax Camps very much. Where do you play soccer in the Bahama’s? I play for the Renegades FC, where I play matches. I also have skill training 3 times a week at the Premier Skills. There we learn stuff like formations, positioning and how we should move as a group. We also practise quick feet a lot and we participated at tournaments in Florida. Unfortunately, we’ve never won at one of those tournaments. Last year, we’ve lost 4-1 against Barcelona in the final. What’s the difference in football between the Netherlands and the Bahama’s? The soccer fields in the Netherlands are much better if you compare it to the fields in the Bahama’s. The Premier Skills have good fields, but most of them are all dusty. There is also more competition in the Netherlands than there is in the Bahama’s. I’m a team player, who likes to do some skills like the step over and the scissor. I don’t score often, because I rather give the assist to one of my teammates. If I have a clear shot, I take it. But is someone else haves a better position for the goal, I make the pass. Lionel Messi, because he’s simply the best. He is very fast and he uses many skills during matches. And what is your favourite club? FC Barcelona and Ajax, of course. When will we see you again at one of the Ajax Camps? We will be in the Netherlands next summer and me and my brother will participate at one of the Ajax Camps during our holiday!